Tours depart at 10 am. Sachsenhausen Memoral guided tours operate daily from mid-February to mid-october. From mid-October to January tours operate on Saturdays, Sundays, Tuesdays and Thursdays. The Memorial is closed for a period between January and February. Available daily from February to October. We are comparing Sachsenhausen Concentration Camp Memorial Tour Prices from leading ticket suppliers and Try to find you Cheap tickets prices on the market. On a guided tour of Sachsenhausen Concentration Camp Memorial you will be thrown into a pivotal time in 20th century Nazi Germany and learn about the injustices and atrocities carried out by Nazi soldiers and Gestapo secret police. Constucted using slave labour during 1936, Sachsenhausen was used to hold over 200,000 victims, considered to be enemies of the state or political opponents, as well as Jewish residents and racial minorities. Over 50,000 of the 200,000 did not survive their imprisonment. During this tour your English speaking guide take you to the execution grounds, hospital, crematorium and Pathology Centre, where unlucky prisoners were experimented on. At each location your guide will explain the uses and functions of the remaining buildings and tell the stories of prisoners such as Stalin's Son and British Marine Commandoes. Also, hear how the camp was liberated by the Soviet Union and later transformed into a prison used to interrogate surviving Nazi's until this tragic camp was finally dismantled in 1950. This is a thought-provoking tour which shows visitors an unsettling aspect of Berlin's past, suitable for adults who would like a comprehensive understanding of the persution that took place under Nazi Germany. A visit to the former camp can be intense and upsetting and perhaps not appropriate for children under the age of 12. 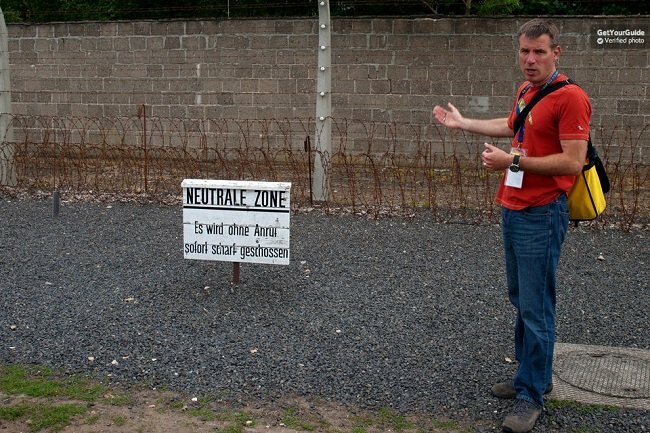 Your Experience With Sachsenhausen Concentration Camp Memorial Tour? Glimpse into a tragic period of German history and hear the heroic and the horrific stories of those imprisoned in Sachsenhausen Concentration Camp. Visit the Jewish Barrack, the Pathology Lab, the Camp Brothel, Infirmary, the SS Canteen, punishment cells, and the Parade Ground. Learn about the camps construction, security systems, later conversion into a post-WWII Nazi prison, and final closure in 1950. Visit the former concentration camp, under the rule of Nazi Germany, and former Nazi prison, under the rule the Soviet Union, with an expert historian, bilingual guide. See where Starlin's Son was imprisoned for 5 years before his execution. What Sachsenhausen Concentration Camp Memorial Tour Includes? 3-hour guided tour if Sachsenhausen Concentration Camp Memorial. Expert English (or Spanish) speaking guide. City map and Berlin information booklet with useful tips on city sights, attraction, restaurants and public transport. Travelers Reviews about Sachsenhausen Concentration Camp Memorial Tour? This is an important thing to do when visiting Berlin according to travellers. Reviews have described the visit as haunting and thought-provoking, but also very informative. The guided tour has 4.5-star ratings on TripAdvisor, 4.8-star ratings on Get Your Guide and 5 out of 5-stars on Viator. Printed or E-tickets will be accepted, please have it with you. Cancellation policies will depend on the tour provider. All tickets are refundable however in order to receive a full refund your reservation must be cancelled in the advised number of days in advance. Transport from Central Berlin to Sachsenhausen is not included in the tickets, you will need to purchase a 1-day ticket for ABC Zone. There are no food or drink facilities onsite. Meeting Point East: Am Zwirngraben exit, Hackescher Markt Train Station, 10178. Infront of AM to PM bar. Meeting Point West: Hardenber Platz, main entrance to Zoologischer Garten Train Station, 10623. Infront od McDonalds.